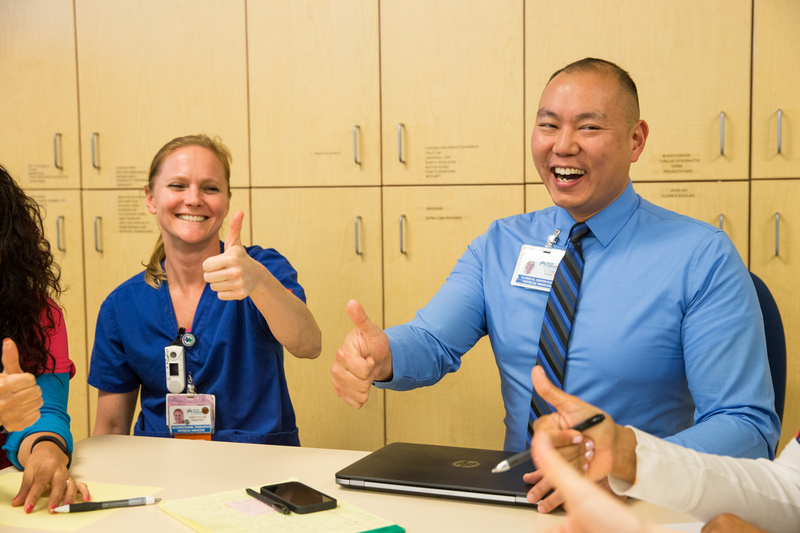 Two thumbs up: Mary Ellen Sweeney, a physical medicine and rehabilitation occupational therapist and a UNAC/UHCP member, and Victor Shen, clinical supervisor, of the Los Angeles Medical Center's Physical Medicine and Rehabilitation department. The Path to Performance provides a consistent way for teams to understand where they are in the developmental process—and what they need to do to move to the next level. It sets standards in seven dimensions of performance: sponsorship, leadership, training, team process, team member engagement, use of tools, and goals and performance. Teams must meet all the criteria of each dimension at each level before they can move to the next level. As teams become high performing, they tend to have better attendance, fewer workplace injuries and better service scores and quality outcomes. A Level 1 team is building a foundation for effectiveness by identifying leaders and sponsors. A Level 2 team is establishing structures to engage all team members and learning techniques of performance improvement. A Level 3 team is demonstrating progress on team engagement and is initiating projects to improve performance. A Level 4 team displays high engagement from all team members and has completed a number of successful improvement projects. A Level 5 team uses sophisticated performance improvement tools and is achieving multiple targets across all four points of the Value Compass. Share this poster version of the Path to Performance with your UBT, so team members can familiarize themselves with what's expected at each level of team development. The poster comes in two sizes, 8.5" x 11" and 11" x 17". One version is interactive, with checkboxes to mark off as your team progresses through the levels.